Successful inspections start with a plan and BeamTool makes it easy to model, validate and document your plan. BeamTool is like CAD (Computer Aided Design) for the world of ultrasonic inspection. This intuitive application allows users to easily design and simulate an inspection and generate comprehensive documentation about their inspection plan. Start by describing the piece to be inspected. Pieces can be described in 3 ways. Simple plate pieces are defined by entering the length, width and thickness of the piece. ID/OD pieces are described by entering the OD and the ID or the thickness. 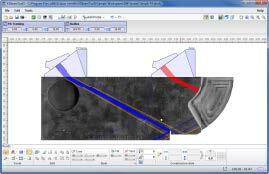 The custom piece mode allows the user to use CAD style drawingtools to draft the subject. Once the piece has been described, position a probe, adjust any beamset parameters to get the best coverage of the area of interest, and visualize beam paths andcoverage. Lastly generate a report documenting your new technique. It's that easy! 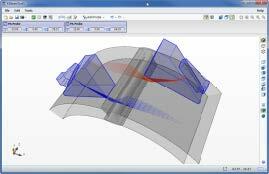 BeamTool was designed to meet the modern operator's need for speed. Phased array technique development is more complex than that for conventional ultrasonic inspection and as such requires effective tools to help define the inspection approach. BeamTool's innovative approach to phased array enables linear, sectorial and an informative reference cursor option to be represented, helping to clearly convey weld coverage, HAZ coverage and probe position, in addition to critical dimensions. The beamset parameters dialogue displays a visual representation of the transducer elements that are used to form the beamset. Beam spread visualization allows you to more accurately see your beamset coverage for a specific dB drop, and near field visualization ensures that any focusing being performed is within the near field. True Depth, Projection and Half Path focus types can be visualized in your workspace and documented in your technique report. Conventional probes can also be modeled in BeamTool with advanced support for beam spread and near field rendering. Time‐Of‐Flight Diffraction support provides tools to visualize and confirm zonal coverage. TOFD techniques can be automatically annotated with cross‐over dimensions and dead‐zone depiction. Effortlessly define Probe Center Separation (PCS) by selecting the cross‐over depth you want and BeamTool automatically positions the probes to target your requirements. Techniques can be created using multiple probes and multiple disciplines within a single workspace. Combine Phased Array with Conventional UT and TOFD probe configurations to ensure complete coverage. Pitch‐catch is a useful technique for viewing unfavourable weld bevels or targeting geometry. 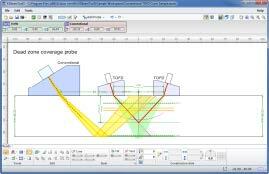 Simply select P/C in the phased array configuration and the BeamTool will solve and present the elements required; this feature can be set to reflect off the weld bevel face accounting for return refraction. BeamTool makes it easy to develop pitch‐catch techniques for direct and indirect inspection using a single probe or a pair of probes. Use the bitmap drawing tool to add images to your drawings. Bitmaps can be imported and scaled to be used as a backdrop or to use as a reference to trace over when drawing complex specimens. BeamTool integrates a powerful set of CAD tools that makes it easy to draw custom pieces to develop a scan plan for your inspection. Users can draw geometries of any shape and size and use the advanced ray‐tracing to accurately ensure and document proper coverage. The drawing tools have been greatly enhanced to make it even easier to draw and edit. Precision coordinate and size readout, along with the ability to snap and a Command Prompt for making complex specimen drawing precise, makes designing custom pieces fast and easy. Multiple layers can be created to organize and filter your geometries. 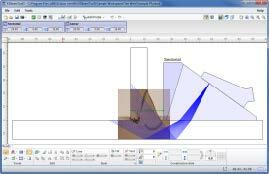 BeamTool provides native support for ID/OD type pieces common in pipeline and boilers. 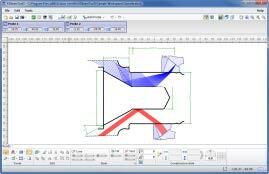 The piece editor allows the piece to be easily defined using the OD and ID or thickness of a part. Once the part is configured, phased array and conventional probes can be pinned to the outside or inside of the part. As the user adjusts the probe location, the probe stays pinned to the part and revolves around it. 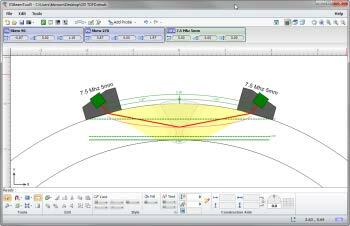 Pick from a list of standard weld configurations or use the advanced weld configuration editor toaccurately create any weld profile you require. Weld cap geometries allow you to clearlyillustrate how close you can get your probe to a weld while ensuring proper coverage. Using the redline drawing system, you can draw defects onto a piece, then use two dimensional ray‐tracing to visualize beam reflections on these simulated defects. This is an excellent visualization tool for communicating technique objectives. HTML standards‐based reporting allows reports to be generated and shared across the web or email. Report content can be copied into other programs, such as Microsoft Word, and edited forfinal presentation. Users can easily customize or create new reports containing the information they need. The built‐in HTML editor allows reports to be constructed in an environment similar to a common word processor. Workspace fields can be dragged from a field picker into the template for inclusion in the report. The BeamTool ZONAL Add‐on provides the ability to define weld zones, which are used in conjunction with a Zonal Beamset to provide automated targeting of individual phased array beams into specific locations along the face of a weld bevel. The powerful new Beam Solver will. This versatile tool simplifies the technique design, validation and reporting process and is adaptable for use by engineers, technicians, and auditors. If you are dealing with ultrasonic inspections and require the ability to visualize and document the applications, BeamTool will guide you through the process and produce the professional results industry demands then optimize the Focal Law.